Custom license plate frames manufacturer: auto, plastic, chrome, military, novelty, aluminum license plate frames. 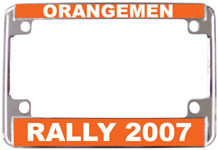 LicensePlateFrames.Biz Custom & Blank For Autos, Trucks, RVs and Bikes. BLANK AND CUSTOM FRAMES AT BELOW WHOLESALE PRICES! FREE SHIPPING! ON ORDERS of $350 or more! We are a premier manufacturer and wholesale supplier of customized and blank heavy duty auto license plate frames, motorcycle license plate frames, scooters and novelty license plate frames. We take pride in our high quality production standards, quick delivery, great customer service and our Low Price Guarantee...if you see it advertised for less we'll beat the price! 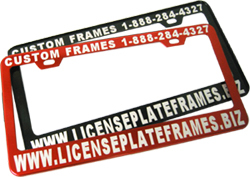 We offer the most popular blank license plate frames in zinc alloy (chrome, black and gold), aluminum and plastic. Custom auto license plate frames are available engraved or with a full color imprint of your name logo or message. Auto frames are available in zinc (chrome, black and gold), aluminum and high impact plastic. Heavy duty metal motorcycle and scooter frames are available with a chrome, black or gold finish. Full color patriotic and camo printed frame designs can be found in our new novelty license plate frames section. Custom camo designs and print patterns are available, please contact us for details. From 1 to 100,000 you have come to the right place for blank and customized plastic and metal frames at the guaranteed lowest wholesale prices! We use the most advanced license plate frame customization methods to produce personalized engraved and full color license plate frames. Custom made frames are ideal for promoting your name, logo or message and enjoyed by businesses, schools, alumni, groups, organizations, clubs and more! We look forward to serving your frame needs.